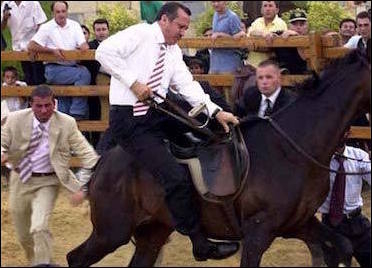 Turkish President Recep Tayyip Erdogan, seconds before being thrown and trampled by a horse in Istanbul, July 2013. Both fascism and communism exercised a large influence on the Arab "Baathist" ideology -- "resurrection" in Arabic, and which started as a nationalist, Sunni Arab movement to combat Western colonial rule and to promote modernization. In Iraq, the despotic Baathist regime survived 35 years, largely under the leadership of Saddam Hussein. In Syria, it is still struggling under the tyranny of President Bashar al-Assad. These days a non-Arab, but Islamist version of the Baathist ideology is flourishing in an otherwise unlikely country: candidate for membership in the European Union (EU), Turkey. President Recep Tayyip Erdogan's increasing authoritarianism is killing Turkey's already slim chances of finding itself a place in the world's more civilized clubs and turning the country more and more into a "Baathist" regime. In 2004 Erdogan's government abolished the death penalty as part of his ambitions at the time to join the EU. Twelve years later, on Oct. 29, 2016, Erdogan addressed fans of his party, and said he would ratify a bill reinstating capital punishment once it passed in parliament despite objections it might spark in the West. He said: "Soon, our government will bring (the bill) to parliament ... It's what the people say that matters, not what the West thinks". EU officials had warned in July that such a move would kill Turkey's accession process. If Turkey reintroduces the death penalty, said Federica Mogherini, the EU's foreign policy chief, it will not be joining the European Union. "Let me be very clear on one thing," she said, "... No country can become an EU member state if it introduces [the] death penalty." 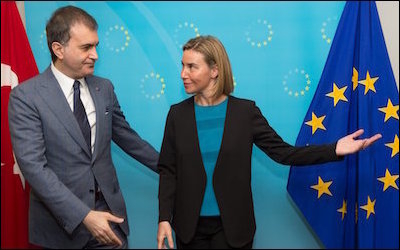 European Union foreign policy chief Federica Mogherini, seen above greeting Turkish Minister for EU Affairs Omer Celik in Brussels last June, says that reintroduction the death penalty will disqualify Turkey from joining the EU. On October 30, Europe once again warned Turkey. "Executing the death penalty is incompatible with membership of the Council of Europe," the 47-member organization, which includes Turkey, tweeted. The potential re-introduction of the death penalty is not the only "Baathist" signal Erdogan's Turkey is making. A court in the predominantly Kurdish province of Diyarbakir arrested Gulten Kisanak and Firat Anli, the Kurdish co-mayors, following their detention, in the latest blow to political opposition in Turkey. The co-mayors are being charged with "being a member of an armed terrorist group," while Anli is also charged with "trying to separate land under the state's sovereignty." "Arrest is a legal term, but [in Turkey] there is no law," said Selahattin Demirtas, co-chairman of a pro-Kurdish opposition party. "This is abduction and kidnapping." Erdogan could not care less. He is busy strengthening his one-man rule. A governmental state of emergency decree on October 29 gave Erdogan powers directly to appoint presidents to nearly 200 universities in the country. Before that decree, he had to choose from three candidates offered by a central board that oversees higher education, based on free elections at universities. Before the Turks could digest so many undemocratic practices they had to face in one week, they woke up only to learn that scores of journalists at a newspaper critical of Erdogan had been detained. On October 31, police raided the homes of 11 people, including executives and journalists of Cumhuriyet newspaper, after prosecutors initiated a probe against them on "terrorism" charges. Cumhuriyet said detention warrants were issued for 15 journalists. The prosecutor's office said the operation was based on accusations that the suspects were "committing crimes on behalf of two terror organizations." This is about ... abolishing all universal values including the right to live and social rights. The most explicit indications of it are the growing pressure against the Turkish press and the policies to destroy it. This is the process of the destruction of free thought. Precisely. "Universal liberties" and "Turkey" have already become a very unpleasant oxymoron. Erdogan's populism, based on religious conservatism and ethnic nationalism, are fast driving Turkey toward Arab Baathism instead of Western democratic culture.